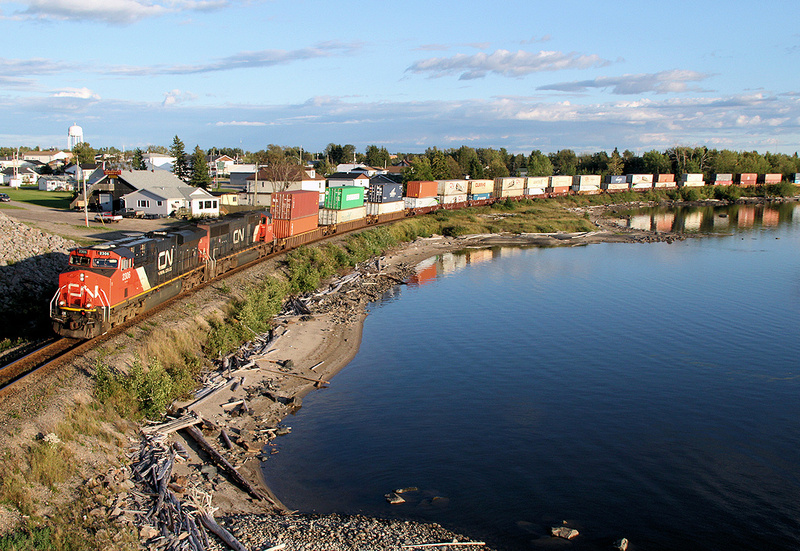 Railpictures.ca - Chris Wilson Photo: CN 2306 leads the pride of the fleet, CN Q111 as it curves along the shores of Long Lake, on the former CNoR, about to take a section of track up to the NTR to Nakina. | Railpictures.ca – Canadian Railway Photography – photographie ferroviaire Canadienne. Copyright Notice: This image ©Chris Wilson all rights reserved. Caption: CN 2306 leads the pride of the fleet, CN Q111 as it curves along the shores of Long Lake, on the former CNoR, about to take a section of track up to the NTR to Nakina.